Your girls are so cute in green! We used to go to the movies ALL the time! But since getting pregnant we've slowed down a lot (getting up to pee constantly and then having the baby). Now I prefer to watch at home too! I have to start making a list of my must see movies. i have never heard of oil pulling!! i'm super intrigued now- that's for sure. and i LOVE all of your in your festive wear. and hello bake-a-thon (i love how auto correct just spelled it "bake-a-thin" YA RIGHT). when do i get to come over and have some of those goodies? ! We make cookie dough all the time and then just eat it straight out of the fridge. It's like...my adult dream come true. My Mom would never let me do that. I have done oil pulling for three days and I definitely have noticed some whitening with the oil pulling, but no I keep checking for updates too. It's just hard to believe a jet can really go missing like that. One. I have never heard of oil pulling sounds interesting. Two. Your green pictures are adorable. Three we don't go to the movies together very much because it's so expensive (Thomas does go with his dad for "free" movies). And Four. We are totally interested in that missing flight as well. Thomas has referred to Lost several times!!! Oil Pulling? I have never heard of this. Sounds interesting, and worth trying! I wonder how long you have to keep doing it consistently to really see a difference? How does your mouth feel afterward? I imagine it feeling like an oil spill. My husband loves cookies straight from the oven and I like cookie dough, so I'll usually make dough and then make a cookie sheet at a time instead of everything and them getting stale. Haha autocorrect, nice try! I think oil pulling is a big fad, but I'm all for natural remedies. My teeth are too sensitive for white stripes now, so I'll do whatever I can to combat all the coffee I drink! LOVING Kenley and those adorable leggings! I feel like oil pulling is a HUGE fad right now---like every form of social media has it trending big time. I can't say that I really care to try it but interesting that you are tolerating it without gagging! And yes, the plane deal is SO weird and intriguing. 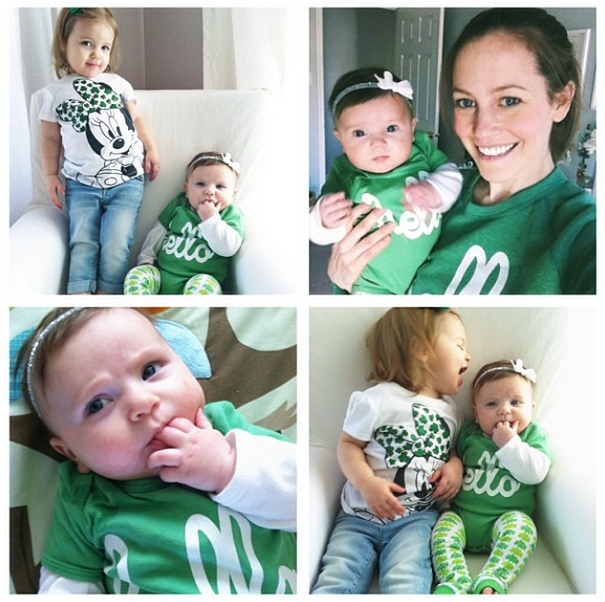 You girls are too cute in your green!! I have been doing oil pulling for awhile now and have really noticed my teeth are less sensitive and whiter, sour patch kids are a killer!! Loooooved Lost and agree this is all crazy with the plane, I have been obsessed as well. Happy St Patty's Day Eve! Xo! Love love love the girls' outfits! Could they be any cuter? And I'm intrigued by the oil pulling, but have been so stuffed up and miserable for the last few months I can't even imagine being able to breathe through my nose for 20 minutes. Happy St. Pat's! I had a big bowl of Lucky Charms for breakfast this morning. Sooo yeah. My husband and I were movie fanatics before we had a baby. Now we've been only once since. BUT I just read this article (can't stop shuddering) about how many bugs and roaches live on the sticky, gross floors at theaters and now I may never, ever, ever, EVERRRR go back. Catching Fire is an AWESOME movie -- so are all the others in your queue. I actually just ordered some coconut oil to give this pulling thing a try, so we shall see.